My buddy Keith has said a lot of funny things on purpose, but with his “more crunch for your slurp” comment he was able to accurately summarize the technique required to make a meal. When it comes to providing a meal, you must add depth through different consistencies. People around the world have different words for different things. Unless they are from America, their words are wrong. 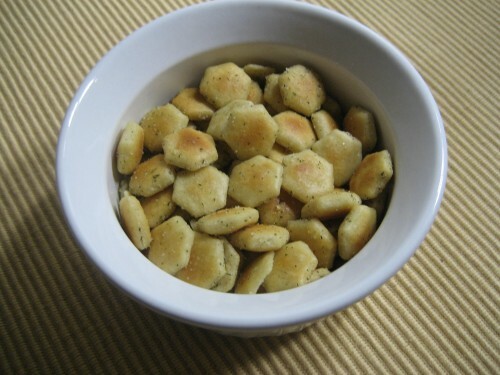 These are known as oyster crackers. For the most part, you will see crunch readily accompany meals in the form of a salad, but there are many other ways to get more crunch for your slurp. If you are making a sandwich, you are probably using the key ingredients of bread, meat, cheese, veggies. What if you are using a meat spread like deviled ham, and your only veggies are lacking crunch? Well, you either get your crunch from some onions or lettuce, or toast that bread. If you are serving up a soup, you had better get your crunch added by means of crackers or toasted bread, otherwise you aren’t having a meal, you are just having slurp. You don’t just want slurp. You want to have crunch with your slurp. Something like this should be taught in a cooking 101 class, but rather it was taught to me inadvertantly by a genius who was willing to pay me a dollar to go to the store to buy oyster crackers so he could eat his tomato soup. He didn’t just pay me the dollar; he gave me some soup and a life lesson. You need more crunch for your slurp.